The elegant Japanese kimono on these pages are one-of-a-kind works of textile art that can either be displayed or worn. A range of decorative approaches is shown in these kimonos: intricate embroidery in satin stitch or metallic couching, delicate shaded hand painting, applied gold foil, elaborate brocading, and intricate ikat or tie dye. For an explanation of these techniques, go to Japanese Kimono Design Techniques. Styles range from austere geometrics or subtle floral motifs to bold, dramatic statements--from subtle elegance to festive exuberance. To sum up, in our collections we have focused on hand-decorated textile expressions, rather than the ordinary machine-printed garments that dominate the market. These kimono, uchikake, shiromuku, tomesode, furisode, hikizuri, haori, and obi date from the late 1800s through the 1970s. All are in good condition--pristine--with no tears or damaged areas. Unlike new garments, however, lovely vintage kimonos may have tiny faint areas of minor discoloration -- a patina of age and use that is acceptable to most people who prefer beautiful early pieces. I have chosen the garments on these pages carefully, but no sale is final until you have inspected the pieces sent to you and you decide that they please you also. A NOTE ON SIZES: If you are interested in wearing vintage kimono, garments measuring 48" across the shoulders/arms fit sizes 2-4-6-8-10, and those measuring at least 50" across fit sizes 2-4-6-8-10-12-14. All are long, by western standards, as Japanese women pulled them up to the exact length required and held them in place with obi. Westerners often wear them open or with sashes or chain belts, and bloused. Haori--short jackets--were worn open. Uchikake--wedding kimono--with their heavy padded hems, were also worn open, and trailing. Click on the inventory numbers below to see full views of the garments below and large close-up photos. Then check out our selections of Japanese Haori and Japanese Obi. You may wish to go directly to our Collector's Page. Assorted questions are answered in Kimono Questions. For other textile art go to our HOME page. Silk faille with brocaded motif. Rinzu silk, with floral motif. Silk with stencil-style floral design. with yuzen dyeing and embroidery. Late 1930s or early 1940s. Silk kimono with double ikat design. 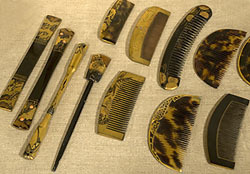 Tortoise shell, with lacquered, inlaid, coral and filigree ornamentation.